Welcome to our website. We hope it will give you some idea of what we are doing and what we have done – including ongoing campaigns – as well as sources of further information. Scottish Solidarity with Kurdistan was set up to promote links between Scotland and Kurdistan – between individuals and communities, and between Scottish organisations such as trade unions, women’s groups and other democratically constituted groups and elected representatives, and their Kurdish counterparts. We give support to the struggle in Kurdistan for peace, democracy and freedom as determined by the Kurdish people. We raise awareness of Kurdish issues in Scotland and in Scottish organisations. We raise funds to assist with the Kurdish struggle and in support of refugees and others affected by war and violence. Please share our material with your friends (but be careful not to share anything that includes an image of Ocalan or a PKK flag on facebook as it could get you banned!). Kurdish people have suffered oppression in each of the states that Kurdistan was divided between. In Iraq, Iran, Syria and Turkey they have, to varying degrees, been denied the right to citizenship, the use of their language in schools and workplaces, and even to identify as Kurds. Attempts to challenge these injustices have been met with violence, arrests, torture and deaths. However the Kurds have protested again and again for their human, civil and national rights. In recent years Kurds have come to the world’s attention as the best fighters against the brutal forces of Daesh (ISIS). In South Kurdistan in Iraq, the Kurdish Peshmerga forces, along with the PKK, including Ezidi freedom fighters, reclaimed the Sinjar region from Daesh, who had been committing genocide on the Ezidi people until their advance was halted. 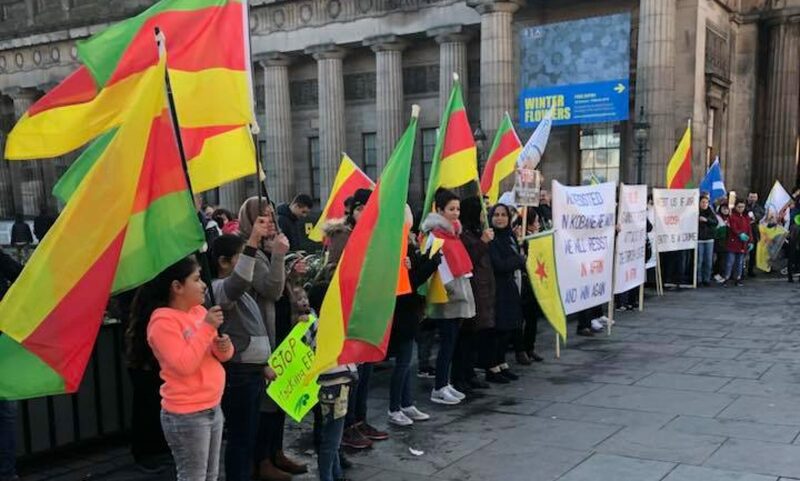 In Syria, from the heroic defence of Kobane to the liberation of Raqqa, the Kurdish fighters of the YPG and the Kurdish women fighters of the YPJ showed their determination to combat the dark forces of reaction, slavery and genocide. Whilst defeating Daesh the Kurds have been creating a new society where democracy, secularism and gender equality have been established. In Turkey, Kurds built a democratic movement for peace, and through the People’s Democratic Party (HDP) achieved representation in Parliament, despite the undemocratic nature of the Turkish electoral system. This success, inspired by the writings of imprisoned Kurdish leader Abdullah Ocalan, has met with a vicious reaction from the Turkish government. Hundreds of people, including children and elderly people, have been killed as Turkish troops placed towns and districts under curfew and then shelled houses and public buildings, shooting at anyone seen on the street. Following the failed coup attempt, the Turkish government has cracked down on all opposition. The attacks on the Kurds have continued, despite the HDP and other Kurdish organisations condemning the attempted coup. The outlawed, but very popular, Kurdistan Workers Party (PKK) had held to a ceasefire for two years until the Turkish government declared war on them. This came after peace negotiations between the government and the Kurds, including the imprisoned Ocalan, had produced results. As part of the plan the PKK would have laid down their arms. But Turkey’s President Erdogan decided that peace with the Kurds and the democratic success of the HDP did not suit his agenda for more centralised power. Now Turkey has invaded the Kurdish region of Afrin and are pushing forward with ethnic cleansing whilst threatening to invade the rest of Rojava.